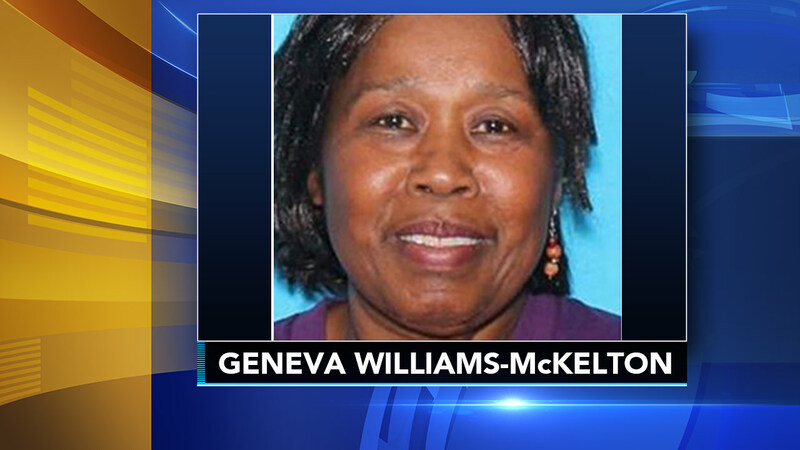 PHILADELPHIA (WPVI) -- Police and family are very concerned about the welfare of 72-year-old Geneva Williams-McKelton, who has been missing since last Friday. She suffers from Alzheimer's disease and wouldn't even be able to tell somebody her name or where she lives. "I am concerned because it's been so cold and it's been so long," said daughter Chantal McKelton. At a police news conference this afternoon, Chantal made a plea for help finding her missing mother. Geneva Williams-McKelton of the Holmesburg section of the city was last seen leaving her home in the 4000 block of Blakiston last Friday at 3:45 in the afternoon. Chantal said, "She has nothing on her. When she left, she didn't have her phone or a wallet or anything. All she has is her house key around her neck." Geneva, who goes by the nickname Trish or Aunt Trish, suffers from Alzheimer's disease. She grew up in the Olney area and may be inclined to go there. "She gets confused very quickly. And there's a lot of basic information about herself she doesn't know. So she wouldn't be able to tell anybody where she lived or even her own name," Chantal said. Philadelphia Police Lt. Dennis Rosenbaum said, "With the weather from last Friday, and again today, we obviously, the family's concerned as are we." Chantal is praying some kind soul took her mother in from the cold. "I need Good Samaritans. Somebody to kindly look out for her because I don't know whether she's eaten or slept or where she slept. So if anybody would take her in until they can call the police and find out who she is and that there are people who are looking for her. Because I don't think she even knows that that people are looking for her," Chantal added. Search for missing woman with Alzheimer's in Philadelphia. Sarah Bloomquist reports during Action News at 5 p.m. on January 17, 2018. Geneva is described as 5'7, 190 lbs., heavy build, brown eyes, medium complexion, and black hair (ear length). She was last seen wearing a light blue jacket, black jeans, and black sneakers. Police have been in contact with police in surrounding communities as well, including up in Bucks County. If you spot her, police ask that you get her to a warm place and call 911 or Northeast Detectives at 215-686-3153.